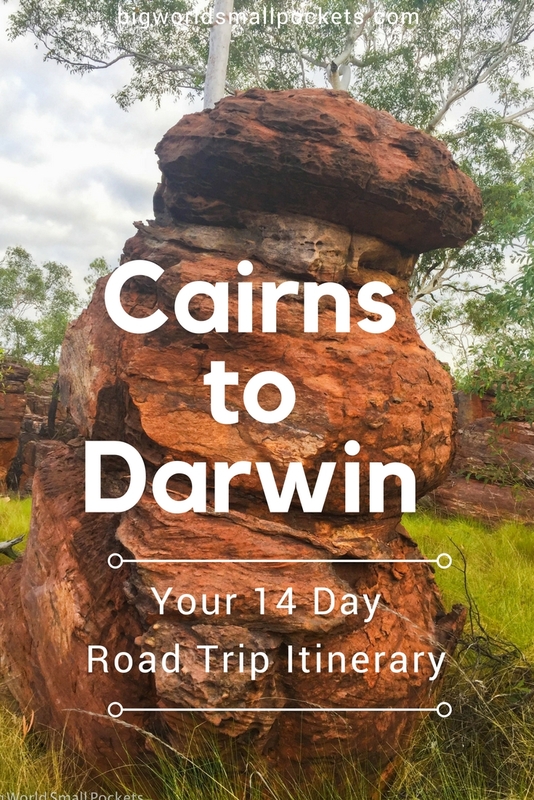 Throughout our whole 4wd road trip around Australia, it’s definitely the section from Cairns to Darwin that sticks out most in our minds. Forming part of the Savannah Way, this dry and desolate part of the country won’t have you bumping into lots of people. But what it lacks in terms of human population, this part of Australia more than makes up for when it comes to some raw, wild and stunning scenery. I’ve chosen to write this road travelling from east to west as that’s the direction we drove, but you could just of course travel west to east along the same route. Just remember to pick your travel time well – summer season up here can get pretty steamy and a cyclone or 2 is not unheard of. Enjoy a day in the adventure capital of North Queensland before you leave civilisation far behind! Make sure you stock up on supplies here in Cairns, including anything you’ll need for the long car journey. If you want a little test run, then heading out to the nearby enclave of Trinity Beach is well worth an afternoon. Otherwise, why not enjoy a relax at the brilliant Esplanade Lagoon – it sure beats getting munched by all those crocs! It’s time to set sail on the journey west … but, before you do, you can’t miss out on a sidetrip to the beautiful seaside resort of Port Douglas. Just over an hour north of Cairns, this gorgeous little enclave is the perfect place to relax into your road trip and soak up that last bit of Queensland coastline … where you can swim! Yup during certain months of the year, swimming at the main beach in Port Douglas is considered safe and given the temperatures and the stunning coastline – who can resist! On your second day in Port Douglas it’s definitely time to explore the nearby reef which you can easily do via a snorkeling, boat or scuba diving trip. You’re closer to the Outer Reef here in Port Douglas, than at Cairns, and the crowds are thinner, so it definitely gets my vote! 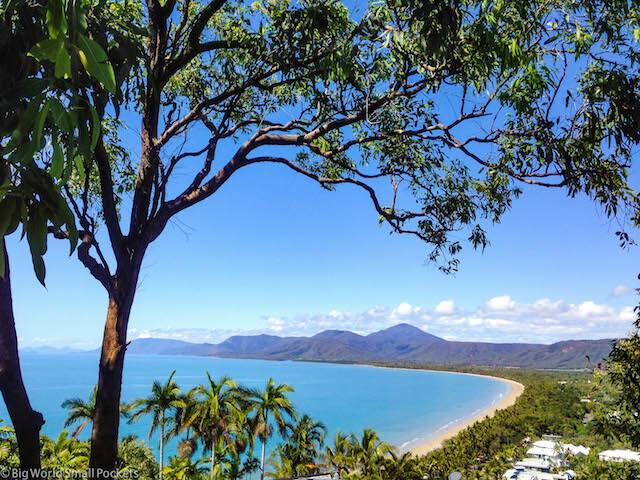 And finally, don’t miss a trip to the Port Douglas lookout while you’re in town. The sweeping view line of the coast here is hard to beat. If you have a few spare days up your sleeve then I strongly recommend a side trip to Cape Tribulation from Port Douglas. This remote outposting is definitely one of the best places to visit in Tropical North Queensland. 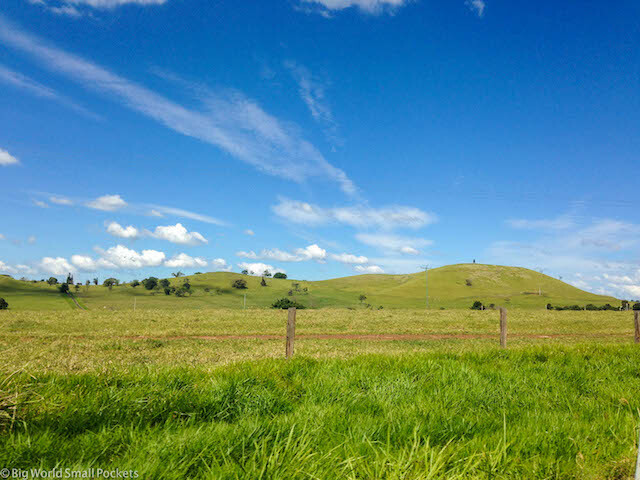 After Port Douglas, it’s definitely time to start making your way west, beginning with the beautiful Atherton Tablelands, which lie just inland from Cairns. The quickest way to get here from Port Douglas is via the Mossman/Mt Molloy Road and then the Mulligan Highway, but if you’re up for an adventure, the incredible Kuranda Range Road is an amazing stretch of tarmac that twists and turns steeply as you climb the rainforested hill. Once in the Atherton Tablelands, base yourself either at Mareeba, Kuranda or Atherton and explore the surrounding area from there. From boutique food producers to colourful markets, stunning waterfalls, cute country towns and some beautiful national parks, there’s more than enough to do in this part of Queensland to amuse you for a few days. 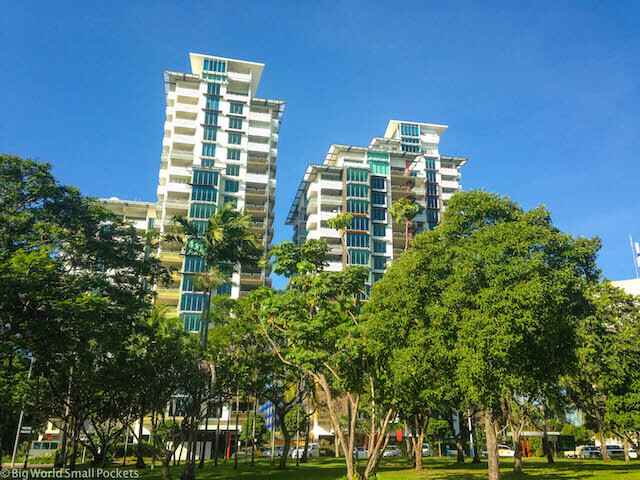 Check out my list of the top picks here. Oh and did I tell you this is prime avocado and macadamia territory – YUM! Get Your Free EBooklet Now! Leaving Atherton, it’s time to get serious about the road trip and begin the drive along the real Savannah Way. Your first stop should be Croyden, which is a GOOD day’s drive away, but a beautiful little town well worth taking some time to explore. 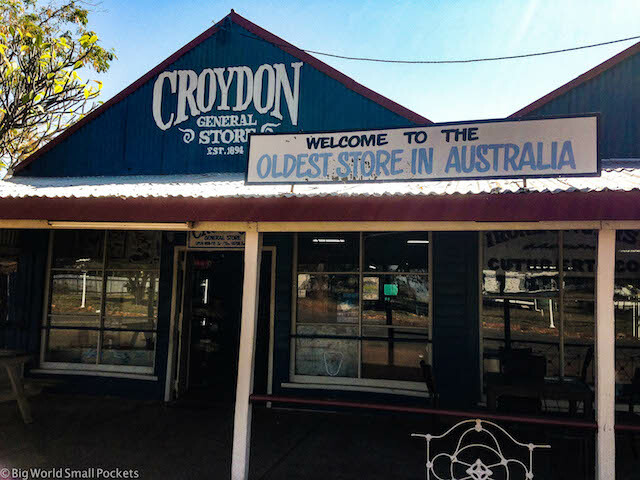 We loved the old shop – the famous Croydon General Store – which has continuously traded since 1894, and the town’s heritage precinct which adds a real flavor of character to this historic goldmining town. On the way to Croyden, drop in Georgetown and check out the TerrEstrial Centre, which is home to a collection of over 4500 gemstones sourced in this mineral rich part of the country. Next up along the Savannah Way is the town on Normanton, famous for its Purple Pub and Krys the Croc. When a town’s 2 most famous icons are its pub and its large crocodile stature, you know you’re in real Outback territory, but nevertheless, we quite enjoyed spending a day wandering this old town and its rather wild feel. 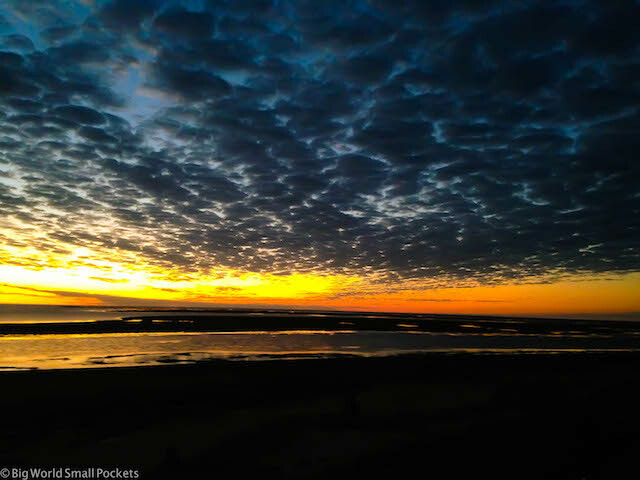 For sunset, you have to venture to an hour north to the town of Karumba, which sits on the edge of the Gulf of Carpentaria. Here you’ll be in for a serious sunset treat! 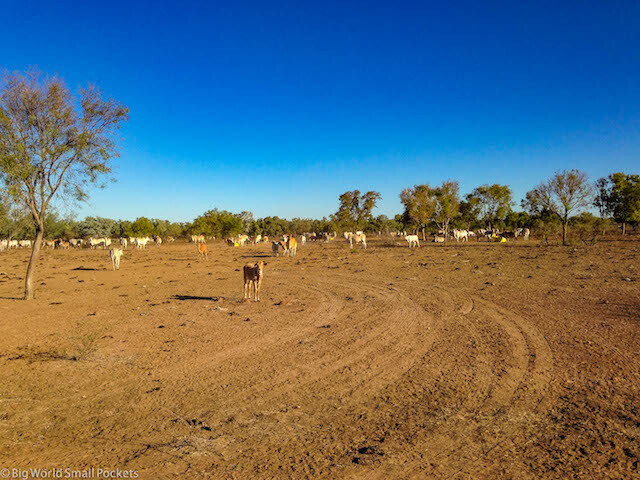 As the administrative centre for a shire 40,126.8 square km in size, it may perhaps come as a surprise to you that in the 2011 census, Burketown had a population of just 201 people. Yes welcome to Outback Queensland my friend! The remoteness of this giant land really does start to hit home when you visit places like Burketown and, for this alone, it’s worth a visit. It’s also the barramundi capital of Australia. Plus, you kinda have to stop for fuel! If you’re not in a rush, then a sidetrip from Burketown to the incredible Boodjamulla National Park is well worth it. Plan to spend at least a few days here, as there is so much to see and do, including hiking and kayaking. 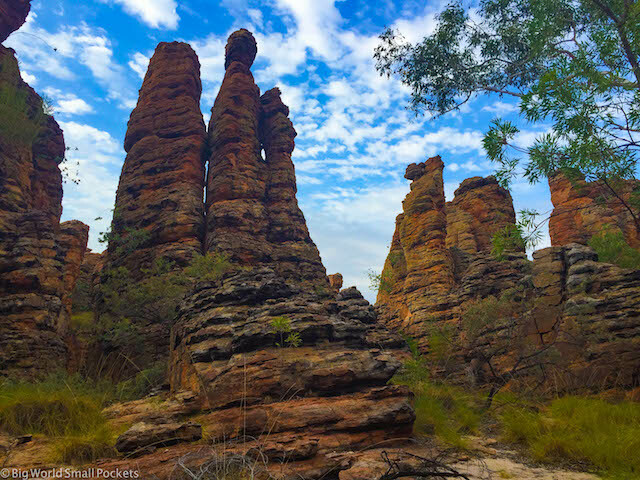 Read more in my Ultimate Guide to Boodjamulla National Park. 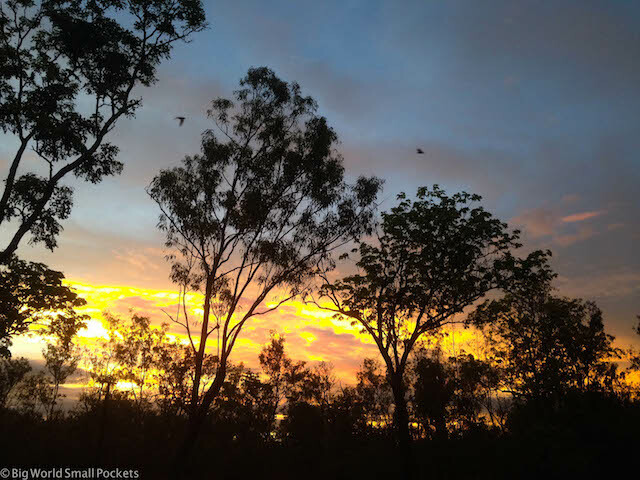 There’s not much to say about Borroloola apart from perhaps – get in and get out! Nevertheless it’s a stop you’ll need to make to refuel and spend the night, if nothing else. So here the route from Cairns to Darwin diverges depending on whether you’re in a 4wd vehicle or not. 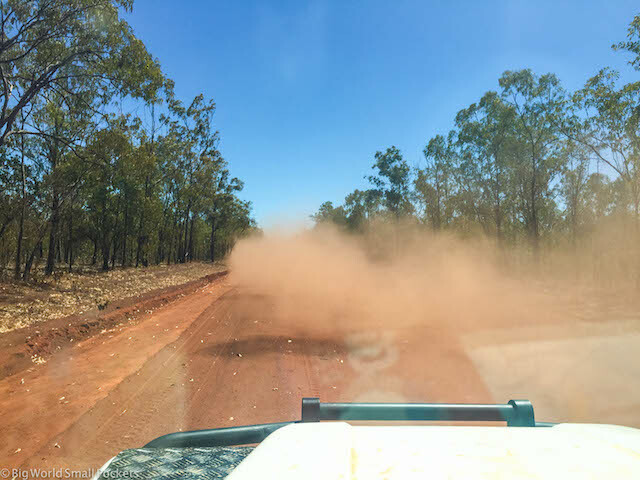 As we were in a 4wd, we thought we’d take the road less travelled and head north from Borroloola into Limmen National Park. Well, that was quite the adventure! After 8 hours bumping up and down on badly corrugated roads we sure were glad to see the campsite! It was a great experience to wander around the impressive Lost City here too, but given half the chance, I definitely think we’d choose the bitumen route on our return! 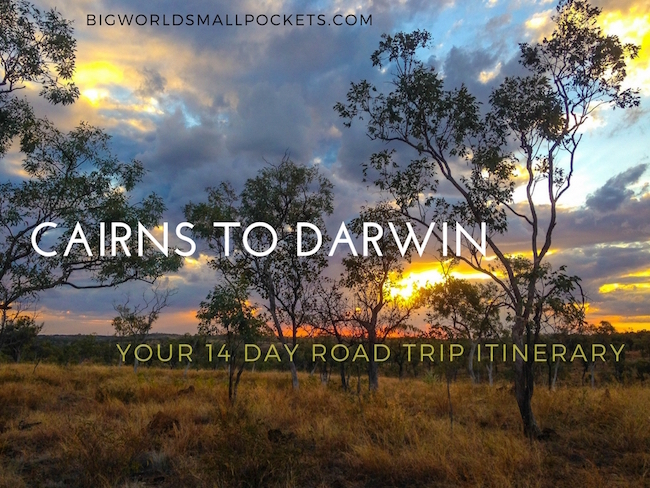 This much more relaxed drive will take you straight into the Northern Territory and the town of Daly Waters, which has a very famous and character-filled pub! Whichever road you take, make a beeline the next day for Mataranka, where the amazing hot springs of Elsey National Park, will sooth away any Outback driving tensions! 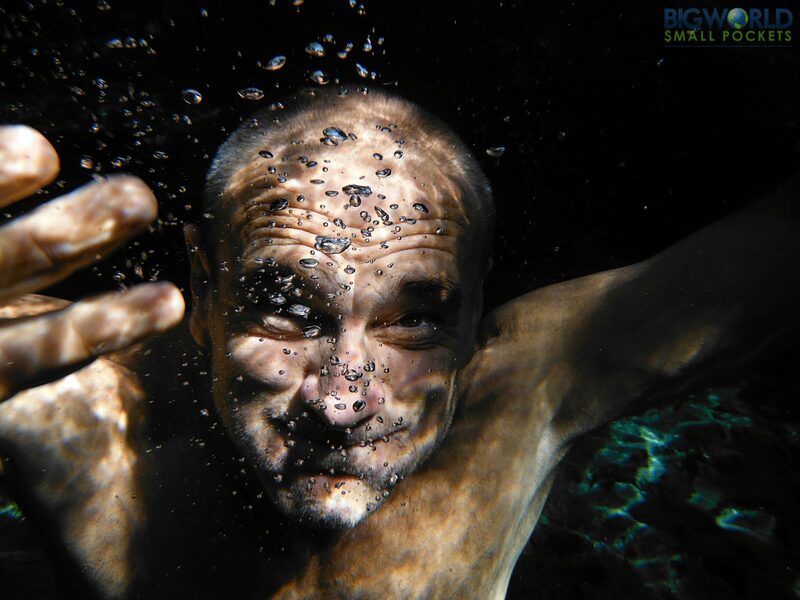 Plan to spend as much as time as possible in these amazing free, natural hot pools and enjoy just relaxing as the health-giving properties of the water rejuvenate you! After Mataranka, it’s not too far a drive to the city of Katherine, where you can stock up on some much needed supplies! 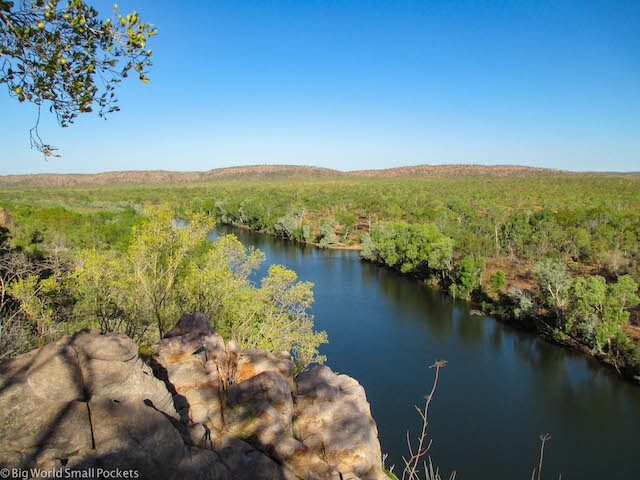 The town has a great visitor centre with tons of free info, but the real drawcard is the incredible Nitmiluk National Park, otherwise known as Katherine Gorge. Plan to spend a few days out here so you can hike, kayak and maybe even cruise this enormous natural ravine. Read more in my Ultimate Guide to Katherine Gorge National Park. If you’re not sick of national parks yet, then dropping into Litchfield National Park on your final leg to Darwin from Katherine is highly recommended. From the divine swimming pool at the bottom of Wangi Falls to the epic photo opportunity of Florence Falls, not to mention the giant termite mounds, this place is non-stop brilliant. Discover more in my Ultimate Guide to Litchfield National Park. And then, on day 14, it’s time to arrive into Darwin! The steaming capital of the Northern Territory, the first thing to do here is crack open an ice cold beer and join the masses! Then it’s time to check out the Mindil markets, watch one of the best sunsets in Australia and soak up the rich cultural influences of this crazy and cosmopolitan city. 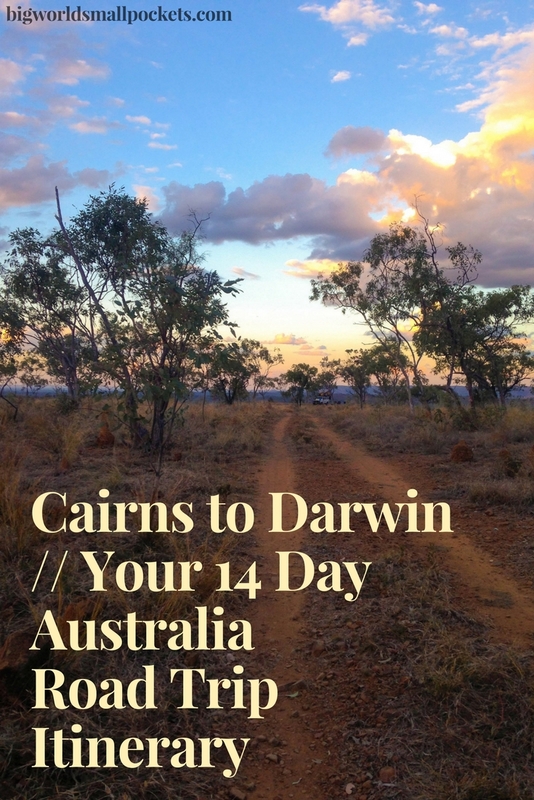 From Darwin, it’s then an easy few hours drive into the amazing Kakadu National Park. The largest national park in Australia, this place does take some beating and I can’t recommend spending a few days there enough! Have you driven this amazing and remote part of Australia too? What was your highlight or lowlight?